This presentation is to define tuberculous sarcoidosis as a distinct clinical en­tity quite separate from tuberculosis or sarcoidosis. Evidence is also presented to postulate that altered mycobacterial infection or its biodegraded products can reasonably be considered as the aetiologic cause of Tuberculous Sarcoidosis. 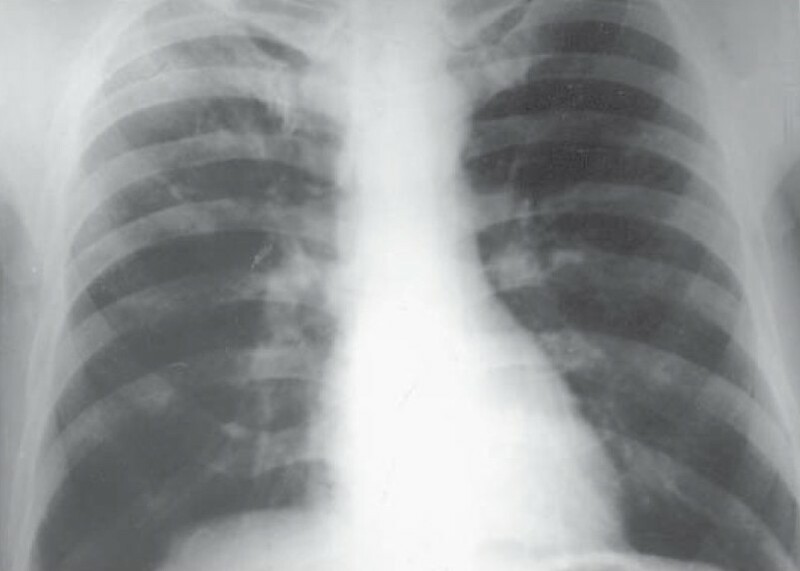 Breast tuberculosis is a rare form of tuberculosis. Moreover the disease is often overlooked and misdiagnosed as carcinoma or pyogenic abscess. 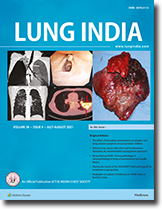 Reports on breast tuberculosis from India have been few; reported incidence of breast tuberculosis amongst the total number of mammary conditions varies between 0.64 and 3.59 per cent. Bilateral involvement is still more uncommon (3%). Most accepted view for spread of infection is centripetal lymphatic spread as axillary node involvement was shown to occur in 50 to 75 per cent of cases of tubercular mastitis. Here we re­port a case of a young female who presented with draining sinuses in the breast and no axillary lymphadenopathy. Fine needle aspiration cytology (FNAC) of breast lump showed evidence of granulomatous mastitis. She was given therapeutic trial of four drug antitubercular treatment. Both the lump disappeared and sinus healed after six months of antitubercular treatment. 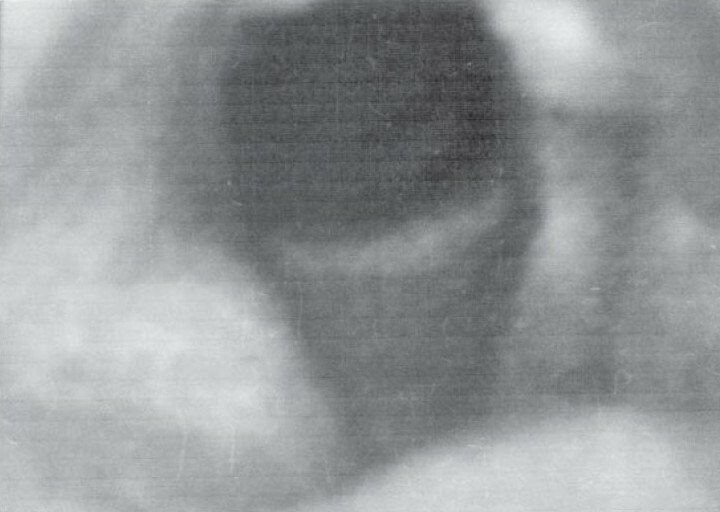 Thus a retrospective diagnosis of tu­bercular mastitis was made. A 45 year-old male presented with cough and expectoration for 8 months, short­ness of breath and wheeze for 3 months, and fever for 1 month. He remained symptomatic despite repeated courses of antibiotics with partial relief on oral and inhaled bronchodilators. Despite several sputum examinations being negative for acid fast bacilli (AFB), he was put on anti-tubercular drugs (ATD) because of bi­lateral infiltrates on his chest radiographs. A mildly raised blood eosinophil count, eosinophilia in broncho-alveolar lavage (BAL) fluid and eosinophilic infiltration on CT guided FNAC from his lung lesion raised the suspicion and the dramatic clinico­radiological improvement with oral corticosteroids clinched the diagnosis of CEP. A 37-year old man presented at our institution with back pain, low-grade fever and weight-loss. 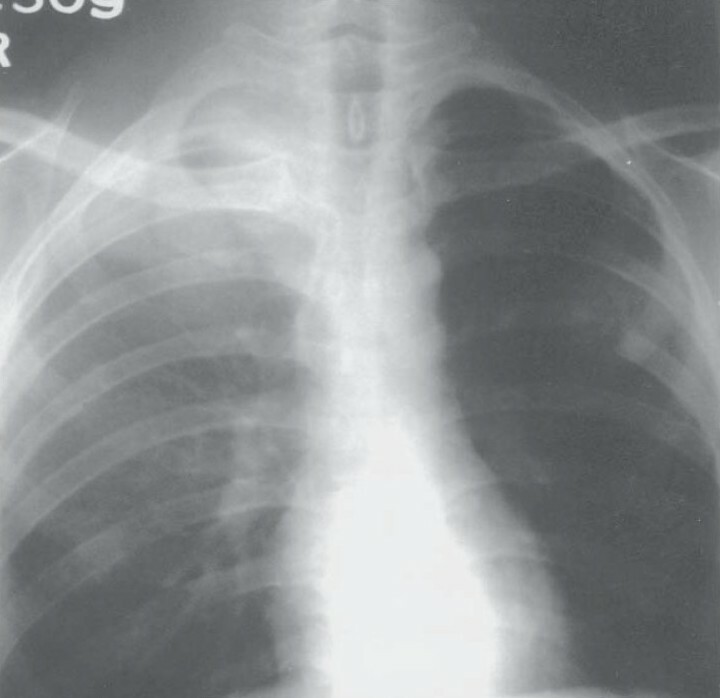 X-ray of chest (postero-anterior view) showed multiple opacities with erosion of right 2nd and left 6th ribs. 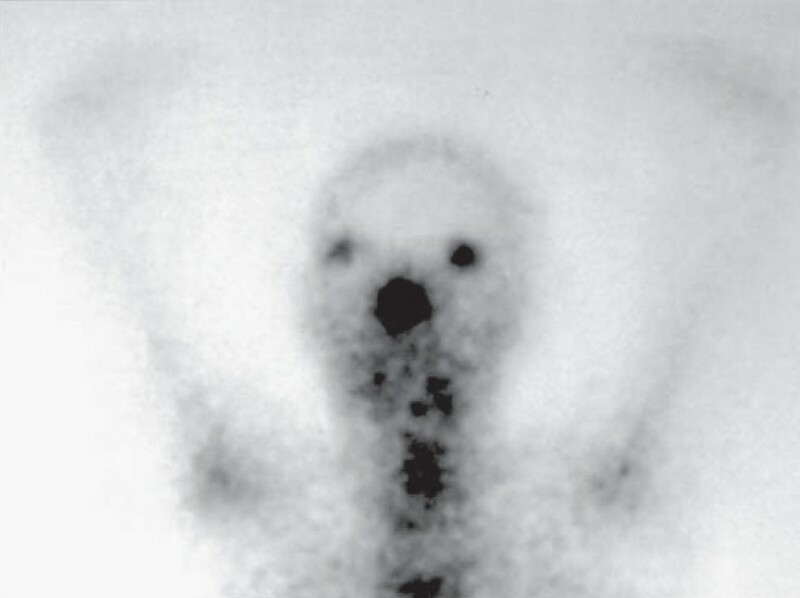 CT-scan of thorax and CT-guided FNAC con­firmed the diagnosis of tuberculosis of ribs. Even after 5-months of treatment with four first line drugs, the patient developed a cold abscess at the back. Mycobacterial culture and drug sensitivity of material aspirated by Radiometric method from the cold abscess showed growth of Mycobacterium tuberculosis, and those bacilli were resistant to both isoniazide and rifampicin. 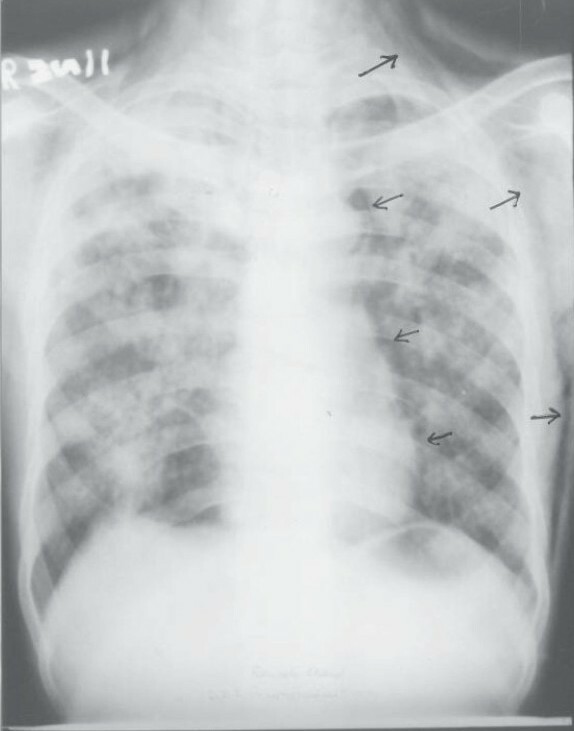 The patient did not have anti-tubercu­lar medication in the past, and that established the diagnosis of primary multidrug resistant tuberculosis of ribs. Patient was treated successfully with 2nd line drugs at the cost of moderate degree of hearing loss. After one and half years of treatment X-ray of chest (PA view) showed complete healing of rib erosions with new bone formation. We report a case of parotid swelling, provisionally diagnosed as tuberculous in­flammation in view of granuloma showing caseous necrosis on cytology and started on antituberculosis drugs. However, on detailed clinical examination and investi­gations diagnosis of sarcoidosis was made. She responded well to treatment with steroids. The correlation of caseation necrosis and sarcoidosis has been described. The present communication describes a case of pulmonary tuberculosis with silico­sis that developed pneumomediastinum with subcutaneous emphysema following anti-tuberculosis chemotherapy. Possible mechanism of such complication and its clinical significance are also described. Increase in the asthma prevalence in many countries over the recent decades, highlights the need for a greater understanding of the risk factors for asthma. Be­cause asthma is the result of interaction between genetic and environmental fac­tors, increasing prevalence is certainly the result of changes in environmental fac­tors because of process of wesernization. That is the reason for higher prevalence in countries where a traditional to a westernized lifestyle occurred earlier. This increasing prevalence has affected both rural and urban communities, suggesting that local environmental factors such as exposure to allergens or industrial air pol­lutions are not the sole cause. In the last few years, nutrition has represented an important conditioning factor of many cardiovascular, gastrointestinal and chronic pulmonary diseases. So it has been hypothesized that dietary constituents influence the immune system and thus, may also be actively involved in the onset of asthma and other allergic diseases. Dietary constituents can play beneficial as well as det­rimental role in asthma. The possible role of diet in the development of asthma can be described as follows: first, a food allergen can cause asthma. Second, there is role of breast-feeding for prevention of asthma later in life. Third, a low intake of antioxidative dietary constituents might be a risk factor for asthma. Moreover, role of cations such as sodium, potassium and magnesium has been described in development of asthma. Finally, intake of fatty acids specially the role of omega-3 and omega-6 fatty acids play important role in cause of asthma.